Peter Nehlsen will give a talk about constructing a unique double-keyboard instrument before the Feb. 9 Peninsula Music Festival February Fest concert. Shepherd of the Bay Lutheran Church will host three Peninsula Music Festival (PMF) February Fest concerts on Feb. 9, 16 and 23. Performances will begin at 2 pm. 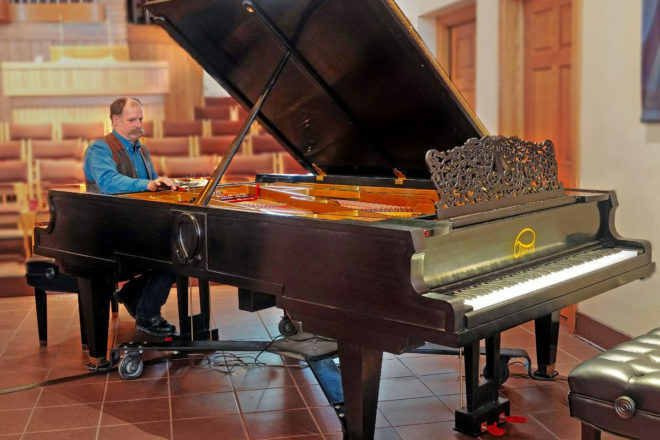 The Feb. 9 concert features pianists Andrew Armstrong and Inna Faliks, who will showcase their talents on the unique “Omega Double” piano created by Washington Island craftsperson Peter Nehlsen. Nehlsen, a furniture maker and highly sought-after piano tuner, will present a pre-concert talk about the construction of the double-keyboard instrument at 1:15 pm. The Feb. 16 concert program brings together two PMF Orchestra trumpet players – Bruce Briney and Dan Grantham – who will perform with pianist Judith Jackson and organist Greg Beem. The Feb. 23 concert features cellist Jeffrey Lastrapes, an accomplished musician on the international stage who has taught throughout the U.S.
General admission is $25 for a single event or $60 for the three-concert series. Tickets for students and children are $5. To reserve tickets, call the PMF office at 920.854.4060.